The HTC One relies on the Qualcomm Snapdragon 600 chipset, which features four 1.7 GHz Krait 300 cores, the Adreno 320 graphics processor and 2 GB of RAM. Snapdragon S4 Pro has a little time to stay on top but now this new configuration is reigning as the benchmark champion best. We'll still have to wait a while to see Tegra 4 and Exynos 5 Octa in action, so for now Snapdragon 600 is the best money can buy. This means that the only smartphone we have tested the One has to fear is the Galaxy S4, which offers the same chipset, but with higher clockspeed. We start you off with BenchmarkPi and Linpack, which evaluate CPU performance in single and multi-core mode, respectively. The HTC finished third in both tests, but it was pretty close to the Galaxy S4 and LG Optimus G Pro ahead of it. Geekbench 2 is cross-platform compound benchmark, which means we get to compare the HTC One performance not only to its Android peers but also to the Apple iPhone 5. The One got another bronze medal, but once again it was closer to those in front of it than to those behind it. AnTuTu tests a little bit of everything. The Samsung Galaxy S4 again managed to walk away with the victory, but this time the HTC One got the best of the Optimus G Pro and managed to come a close second. Quadrant, which is the final compound benchmark we ran told a similar story - an extremely solid performance by the HTC One, which was only narrowly beaten by the Optimus G Pro and the Galaxy S4. GLBenchmark 2.5 is our first GPU test of choice. We run the test in the FullHD 1080p off-screen mode, which lets us evaluate the raw performance power of the Adreno 320 found in the HTC One. It managed an impressive 34 frames per second only coming behind the Samsung Galaxy S4's stunning 40 fps. Epic Citadel is another GPU test, only this time it runs at the screen native resolution. 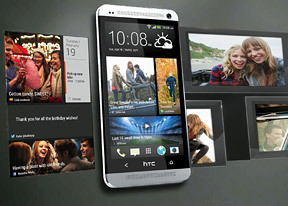 The HTC One achieved 56.4 frames per second here and came close to the Galaxy S4's 57 fps. Keep in mind that both smartphones run into the 60fps limitations of their respective screens, meaning that the difference is slightly bigger than it appears. Vellamo deals with HTML5. The HTC One did very well here and snatched second place. The HTC One proved to be a true powerhouse and even though it failed to capture a single victory it was always close to the top performers. Truth is, you will barely be able to feel such minor differences in real-life usage as all those top phones are impressively smooth and snappy. Zoe is evidence enough of the serious work that has gone into optimizing the HTC One to work great with the powerful processor inside.